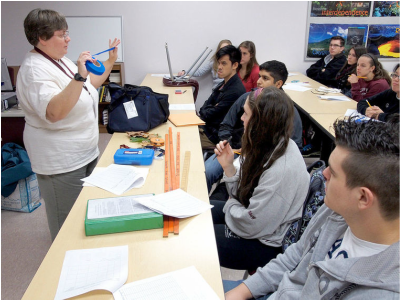 When Falmouth High School science department head Christine C. Brothers announced she would be teaching Advanced Placement (AP) environmental science, a new class offered for the first time this school year, 38 students signed up. To bring the number down to a more manageable 19, Ms. Brothers had to limit enrollment to only students in their senior year. “Everyone talks so highly of her,” senior Callan E. Small said on a recent Thursday morning, as the class walked out to the woods behind the high school. Callan has enjoyed Ms. Brothers’s emphasize on field work and research skills. The hands-on experience is “definitely the best part,” she said. “It’s not your typical AP class where you’re sitting and taking notes,” student Taylor E. Dimond said. When the class reached the woods, Ms. Brothers showed students how to calculate the height of a tree from ground level using a small triangular tool consisting of a level and sight gauge fixed at a 45-degree angle. The purpose of the day’s lab was to assess the biomass of a 30- by 30-meter woodland plot, and from there calculate how much carbon the area stores. Students had to first mark off the plot and divide it into equal quadrants. Standing in the center of the plot, Arlin J. Moore grasped a measuring tape and headed off to mark the northwest corner. Christine Tran held a compass to make sure Arlin kept a straight course as he waded 21 meters into the underbrush. “I found the pricker bush!” Arlin shouted. “Can you go around it?” Ms. Brothers called out. Ms. Brothers has been the head of the science department at Falmouth High School for 13 years, and the school’s AP biology teacher until last year, when she took over responsibility for chairing the Lawrence School science department as well. With the expanded administrative duties, it was expected she would give up teaching, and she did, for a year. “But I didn’t like that. I wanted to be teaching and have that connection with kids,” Ms. Brothers said. Ms. Brothers is the only grade 7-12 department head who also teaches. It has been a busy year, she said, especially because the science department’s laboratory technician was laid off this year to balance the budget. Ms. Brothers said science teachers have not cut back on labs, and are simply working longer hours. Parent volunteers from the new STEM (science, technology, engineering and math) booster club have also pitched in. She said volunteers probably worked 40 hours in the first two months of school, helping to unpack orders and label chemicals for storage. There is a trend in education toward offering “virtual labs,” where computer programs simulate experimental outcomes. Although Ms. Brothers said there are cases where virtual labs are “perfectly warranted,” they are also a tempting shortcut. “It’s cheap, it’s easy, it’s guaranteed that it will work,” she said. Companies offer virtual labs on breeding fruit flies. “I’d rather the kids work with real fruit flies. They’re studying biology, they should work with living things,” she said. But labs are expensive in addition to time consuming. It cost $10,000 to establish the AP environmental science class. Given the fact that the district was in the midst of a budget freeze and staff cuts last spring, and that the high school’s entire science supplies and materials budget is $9,500, “I didn’t want to go to the district and say ‘oh, by the way, I need $10,000’,” Ms. Brothers said. So she secured the funding through grants. A $6,500 Falmouth Education Foundation (FEF) grant paid for lab equipment, including air and water quality test kits. Federal money covered the course’s text books. And a $1,000 grant from the Mass Audubon Society went toward classics in environmental writing—authors such as Aldo Leopold and John Muir—which the students are currently reading.